Click the Information button (“i” icon) on the right sidebar and select Send for Review. You can then select auditors and data reviewers for the Notebook Entry. You need to set auditors in the Project before sending the review. See how to do that here. Once you send the Entry for review, you will not be able to edit the Entry. 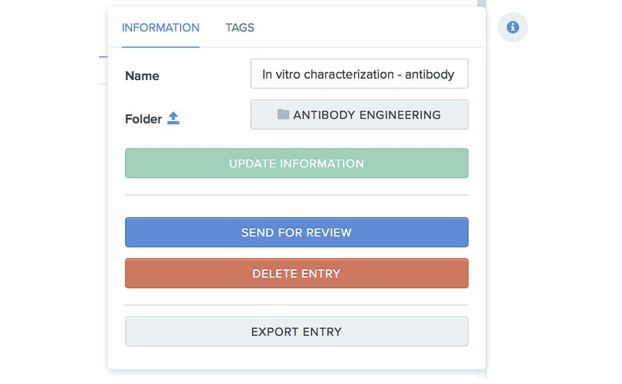 After an Entry is sent for review, you can check the review status in a Review tab, which will appear next to the “Notes”, “Metadata”, and “Protocol” tabs in the Entry. To retract a review, go to the Review tab in the Entry and click Retract. You can leave comments about why you want to retract the Entry as well. Similarly, when you are ready to re-send for review, go to the Review tab and click Resend for Review. Before resending the review, you can edit the auditor and data reviewer if you need. You can view Entries you need to review in the Home tab. Click the Review button to see all Entries you need to review. To accept or reject the Notebook Entry, select Approve or Reject in the review tab.